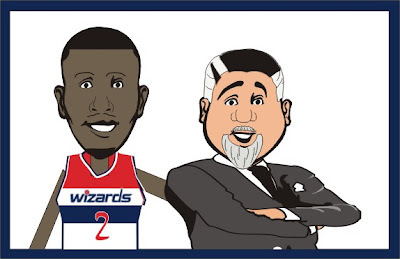 Hip Hops: Why Is Ted Leonsis The Team Mascot? Why Is Ted Leonsis The Team Mascot? The Wizards unveiled their new look today, and right on the first screen of the team web site is a picture of the face of the franchise, John Wall, last year's breakout player Jordan Crawford, and the owner of a hockey team. Now who doesn't fit into this picture. Is it the players on the team? Or could it possibly be the guy in the suit. Nothing says basketball like a guy in a suit. Now it seems everyone talks about how great it is to have Ted Leonsis as an owner. Wow he answers emails! He puts cupholders in the bathroom! He owns a hockey team that nobody watched 5 years ago! That is all great. But how does that make him the face of the team. Why would he put himself out there with the players? He is the owner. He is not G-Wiz. He is not G-Man. He is a suit. I've heard how great Ted Leonsis is over the past few years from Capitals "fans". I heard people excited that he owned the Wizards because he was going to turn the Wiz into the Caps. Usually a person is reviered AFTER they win a championship. I just don't understand where the myth of Ted Leonsis came from. It's not Ted's fault, its the DC sports fans looking for something to believe in I guess. Aside from that I don't really care about the owner. There isn't much he can do about having one of the worst teams in basketball, or about his team choking in the NHL playoffs. I just don't understand why he has to be the face of the team. Like he is tricking us to avoid actually watching the real players. So hopefully instead of taking part in photoshoots and getting standing ovations during one of the worst season's in Wizards history, Ted is actually working on a way to make Ted Leonsis the last person we think about when it comes to the team.